Guillym Davenport has given up. His depression has finally got the better of him so he's spending the night alone, in his bedroom, eating pizza and drinking booze - with us. The show isn't ready, and he's not prepared, but come on in anyway... 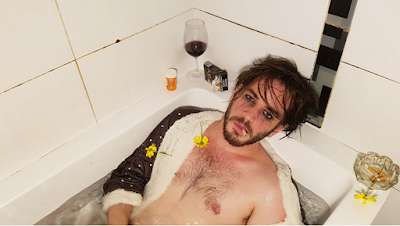 In Give Up, Presented as part of the Melbourne Fringe Festival, Davenport looks at the issues of mental health and what happens when it all gets too much. Davenport is charming, funny and very likeable on stage and there is some intelligent discussion generated around mental health. Unfortunately his attempts at pairing this with the deconstruction of theatre do not work well, creating a haphazard show that doesn’t quite seem to know where it’s headed. There's a scene in which it feels like Davenport is legitimately opening up to the audience as he discusses his depression. He mentions his frustrations at wanting to talk about his mental health with friends but conversation being relegated to talking about trivial things like what TV shows they are watching. It is a genuine moment of vulnerability as he fights back the tears and struggles to finish his sentence. However, when you compare this to the theatrical pretence of the show being unrehearsed and under-prepared, and the self-conscious way in which the final few moments of the show then play out, it almost cheapens this earnestness and makes me question the authenticity of these earlier parts. I feel this work can either try and deconstruct theatre and put itself outside the issues as meta-fiction, or tackle depression as a very real and personal concern from the inside. The problem has come in trying to achieve both, especially with the theme of mental health needing to be addressed in a sensitive and intelligent way. There is a definite place for works like Give Up in contemporary theatre, as mental health - especially in young men - is an extremely important issue to acknowledge, identify and explore. As it currently stands however, I feel this show needs more work on refining the way it is structured and executed to ensure the audience feels the full impact of the message Davenport is trying to share.